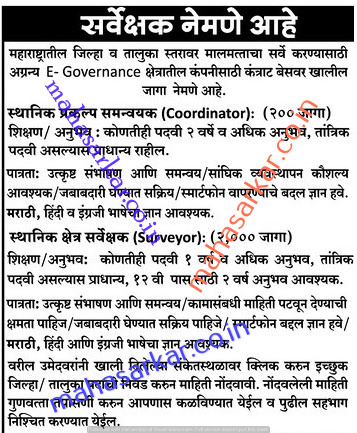 Maha Survey (Maha Sarvekshan), maharashtra Published Job Notification for 2200 Surveyor & Survey Coordinator Posts. Candidates who wish to apply must look at Maha Survey Recruitment 2017. Eligible candidates can apply online before September 2017. Maha Sarvekshan published Job Advertisement telling to apply Maha Survey Recruitment 2017. This new advertisement is about the vacancies of Surveyor & Survey Coordinator. Totally there are 2200 Vacancies. Candidates are advised to read official notification carefully before applying. Education Qualification: Graduation/ Post Graduation/12th and More. For Post wise Education Details follow the detailed advertisement. Interested & Eligible candidates can apply online through the website www.mahasurvey.in earlier than the due date. Starting Date, Last Date to Apply Online at Maha Sarvekshan which candidates should be remember as follows. Start Date to Apply Online: 09-09-2017.
online police verification problem, this document upload company latter upload but I do not have a latter. pls help and soln my problem. जर apply करण्याची शेवटची तारीख सप्टेंबर महीना च होती. तर मग आम्हाला कशाला ऑक्टोबर मधे massage पाठविले. का अगोदरच जागा भरल्या.आणी फ़क्त देखावा म्हणून massage पाठविला. Sir ,mahasurey chi date samor vadhel ky.mala Oct.madhe msg aala ani Sept last date hot tr apply Kasey karnar. Assureid web page open hi nahi hota..
Kon sa browser use kiyaa..
Sir joining kab miligi …. सर जॉइनिंग कधी मिळणार ……? Police verification “assureid” link not opened..
2 months ho gaye aap webpage update nahi kar sakte. Jobs kya khak doge. i am sumit kamble from hingoli dist hingoli mujhe 20-11-2017 apki tarad se call aya tha ki agar aap surveyor ke liye intrastate ho to join kar sakate ho.aur apki taraf se co-coordinator ka call ayenga jab join kar lena aisa kaha gaya hai bt aaj takriban 15 days ho gaye koi call aya nahi. are you fill that form in earlier of September 2017? Exam kadhi aahe plz sanga ….